Let’s start where things end: As the list of dates on which countries around the world finally recognized women’s right to vote scrolled at the end of Suffragette, the oxygen was sucked out of the room. 1971, Switzerland? Are you kidding me?! 19-frickin’-71?! Why were your morality and politics as hole-filled as your delicious cheeses?! It was a brilliant way for a sturdy and important-if-sometimes-unartful film to hammer home the simplest of points (and yet one that is inexplicably controversial to some folks): the fight for the rights of women is not over and has no apparent end date in sight. 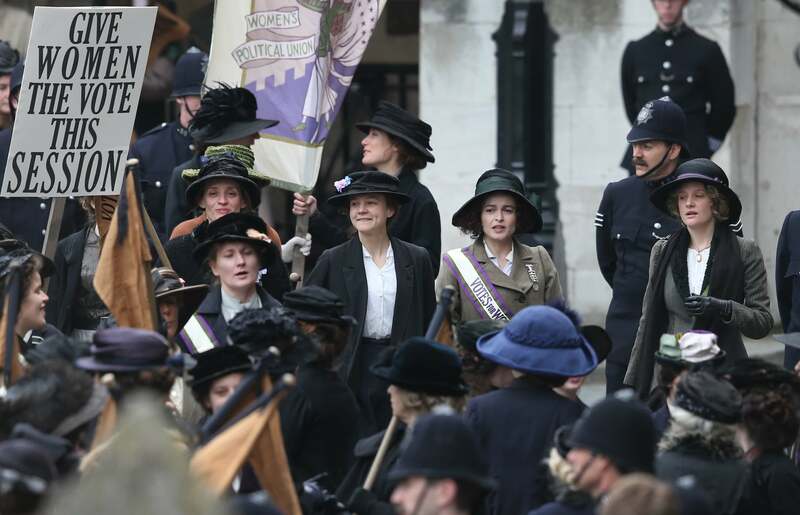 Director Sarah Gavron’s film is set in the lead-up to England’s declaration of suffrage for women in 1918. A young laundress, Maud (Carey Mulligan), toils her life away in an endless, repetitive hell filled with sexual harassment, marital neglect and abject poverty. She’s like Fantine from Les Mis without a catchy tune. She agrees to go with coworker and open suffragette, Violet (Anne-Marie Duff), to support the latter’s testimony to parliament. Unfortunately, Violet’s husband pulped her face the night before because, and this can’t be reiterated enough, life was a never-ending series of tortures for these women. Maud finds herself thrust into the spotlight when forced to testify. Suddenly, she begins embracing what she had considered “radical.” It’s a beautiful, simple motivation that possesses her: She begins to dream of a world even slightly better than the ugly, gnarled, joyless existence she leads. She joins up with Edith (Helena Bonham Carter) under the direction of the movement’s leader-in-hiding, Mrs. Pankhurst (Meryl Streep). Civil disobedience begets escalating acts of vandalism, with strict instructions to harm no one, only property. They blow things up because simply speaking the truth got them nowhere. If that doesn’t gut you, if it doesn’t make you stunned that less than 100 years ago, almost every industrialized nation still saw half of humanity as “less than,” I don’t know why you’d watch or read about a movie called Suffragette. Mulligan is fantastic in a performance that is showy-but-not-too-showy. She gets her weepy moments and her outrage moments, but most are well controlled. This is Oscar bait, yes, but there are two kinds: The kind that responsibly carry the mantle and deliver important messages (Selma) and the kind that could care less about anything but slobbering on a golden statue (The King’s Speech).